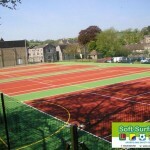 We at Sports and Safety Surfaces have been All Weather and MUGA specialists for over 20 years and have a wide knowledge of installations, restorations and repairing these types of surfaces. In that time, the technology used in making surfaces for these types of conditions have improved dramatically. There are now more options than ever and the science behind them is increasingly impressive. Here is a brief sample of the types of soft surfacing that we offer, but you should contact us for more details if there is something you require that is not mentioned here. As experts in this (polymeric) field, the chances are high that we can supply exactly what you need and at the very best price. 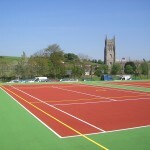 Multisport courts have become increasingly popular over the past few years due to the constraints of having enough space for multiple different fields and courts. MUGA courts are not only able to combine lots of activities on the one surface, but they are durable enough and safe enough to stand up to sustained heavy use. 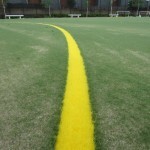 The best surface for multisport usage is needlepunch synthetic turf. 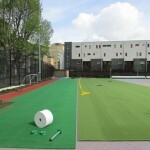 This is a fibre bonded woven artificial grass surface that is perfect for use in a variety of different circumstances. It is popular in a variety of versatile sporting situations, such as long distance jumping, multisport pitches and crown green bowling. The reason for this is because it is extremely hard-wearing and durable and it comes in a variety of colours and design finishes. It also offers fantastic non-slip properties and meets surface accreditation numbers BSEN 7188 and EN 15330. Like most artificial surfaces, needlepunch synthetic turf is extremely porous, which means that standing water and puddles on your sports surface are a thing of the past. The material allows rain to simply drain away, letting the surface perform some of its own maintenance to leave it clean, free from contaminants and extending its own lifespan. Polymeric rubber surfacing is another very popular choice, as this surface is extremely durable and perfect for sports that require a lot of grip. Tennis courts, basketball courts and hockey pitches are just some of the sports that benefit from the EPDM rubber granules mixed with a binder solution to create a springy, but safe surface. It is available in a variety of vibrant colour finishes and once it is combined with an anti-slip paint treatment, the surface is even safer and provides added grip and enhances game quality. Polymeric rubber surfacing is also porous and SUDS compliant, which means that water will simply filter away leaving no standing water or puddles. Macadam surfacing is an extremely tough surface which is why it is most popular with schools for use on all-weather pitches. Its durability is its main selling point as it requires very little in the way of maintenance. Its bounce properties make it ideal for use as a tennis or netball court surface and, once it is painted with an anti-slip coating, meets with TRRL 75 standard to meet AENA standards for the netball governing body. The paint is available in a choice of five different colours and conforms to a number of health and safety standards. Like polymeric surfacing, macadam surfaces are fully porous and allow rain and standing water to simply run off, thereby extending the life of the surface and making it safer to play on. 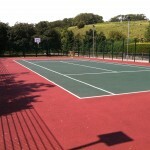 If you are interested in macadam MUGA courts, make certain to enquire with our team today. 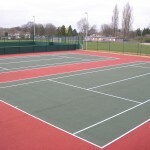 We can offer you the very best prices for the multisport courts and can also provide competitive rates for anti-slip painting, colour coating and more. 2G sand filled/ sand dressed synthetic turf is an excellent choice as an all-weather pitch and perfect for a game of football or hockey. The main advantage of this material is that at the base of the synthetic fibres is a layer of sand. This sand layer allows the turf pile to stay standing upright, which allows the ball more fluidity to roll across the pitch. The sand also allows the layers to be completely porous, which makes this material ideal for all-weather pitches. 2G synthetic surfacing is great for multisport courts. If you are looking to have a court built for football and hockey, in particular, it is highly recommended to get 2G surfacing installed. It depends on the sports you wish to play whether you get sand filled or sand dressed turf. Our team can offer professional advice on which surfacing is best, so please do not hesitate to get in touch with us today. The 3G artificial grass surface is the one most installations use for rugby and football, as the artificial grass and rubber crumb granules that are infused in the surface give the most natural playing characteristics. The pile is available from 32mm for a hockey surface, up to 60mm for a rugby surface. With football and rugby being amongst the most physical games being played, this surface has an additional ace up its sleeve. It has a shock absorber layer built into to help minimise the risk of injury. As with the other forms of MUGA surfacing, there is a porous sub-base, so water will simply drain away and abandoned matches due to the state of the pitch are a thing of the past. All of these surfaces employ the latest technology and are very simple to install. 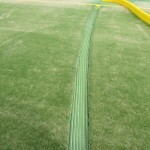 Of the five surfaces mentioned above, needlepunch synthetic grass is the one that we install most often. The reason for this is that it is so versatile. Depending on what the surface is being used for, it can either be installed onto a dynamic sub-base or an engineered sub base. 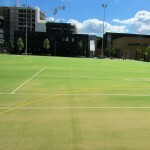 If the surface will be used for an athletics track, a shockpad system can be installed to make it more impact resistant. The needlepunch surface itself is made up of a system of woven layers with sand at its base. It has the highest sand to fibre ratio of all our forms of artificial grass surfaces and the sand works to help with both stability and drainage. Needlepunch is extremely hard-wearing and has a life expectancy of around 10 years, but with regular maintenance, this can easily be enhanced by a further 5 years. Needlepunch synthetic surfaces are available in a wide range of colours and the most popular choice for schools and communal areas to be used as an all-weather pitch. If we can help you with any aspect of surfaces for multisport courts, please do not hesitate to drop us a line and one of our experts will be pleased to go through all the available prices and configurations. Our installers have a wealth of knowledge and we are confident that we can cater for your needs professionally and within your budget.